Ryanair has slashed its full-year profit forecast citing pilot and cabin crew strikes, spiralling fuel prices, EU compensation costs and a decline in third quarter bookings. The budget carrier has cut its profit guidance, excluding its Laudamotion subsidiary, from €1.25-€1.35 billion to €1.10-€1.20 billion amid fears of plummeting consumer confidence. According to the airline, two days of “coordinated” pilot and cabin crew strikes in Germany, the Netherlands, Belgium, Spain and Portugal had reduced traffic and forced fares down. It said fear of further strikes was affecting consumer confidence, noting lower Q3 forward bookings - particularly during school breaks in October and over Christmas. The airline further cited higher EU261 care, accommodation and compensation costs arising from the strikes and higher global fuel prices. Ryanair has also trimmed its winter capacity by 1% in light of the current “lower fare, higher oil and higher EU261 cost environment”. Effective from November 5, Ryanair will withdraw eight aircraft based in mainland Europe – four at Eindhoven in the Netherlands, and two at Bremen and two at Niederrhein in Germany. According to Ryanair, “Most” Eindhoven routes will continue using overseas-based aircraft while Bremen routes will be largely served by non-German aircraft. Most routes at Niederrhein, where Ryanair will continue to base three aircraft, will be operated using these aircraft. 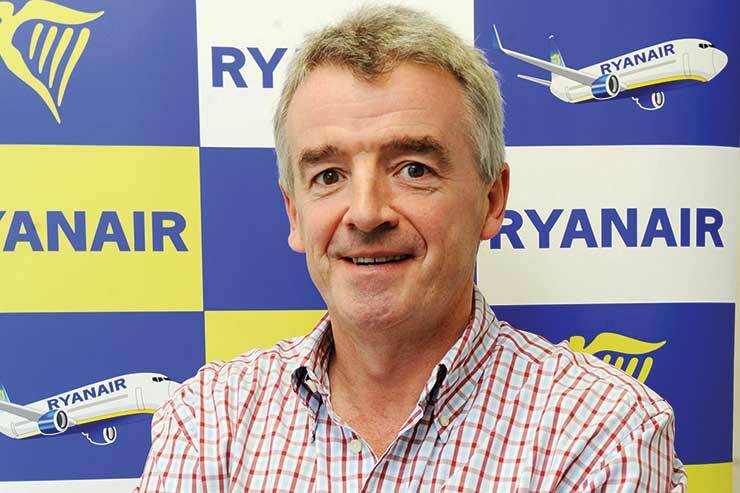 Ryanair chief executive Michael O’Leary said: “While we successfully managed five strikes by 25% of our Irish pilots this summer, two recent coordinated strikes by cabin crew and pilots across five EU countries has affected passenger numbers (through flight cancellations), close in bookings and yields (as we re-accommodate disrupted passengers), and forward air fares into Q3. “While we regret these disruptions, we have on both strike days operated over 90% of our schedule. However, customer confidence, forward bookings and Q3 fares has been affected, most notably over the Oct school mid-terms and Christmas, in those five countries where unnecessary strikes have been repeated. Ryanair said all customers affected by changes to its bases in Europe have been contacted and would be re-accommodated and/or refunded. It said it would now enter into a period of consultation with pilots and cabin crew at the three European bases affected to “minimise job losses”. “We expect to offer our pilots vacancies at other Ryanair bases but, as we have a large surplus of winter cabin crew, we will explore unpaid leave and other options to minimise cabin crew job losses,” said the airline in a statement. Ryanair has also warned it cannot rule out “further disruption” during Q3 which could force it further adjust down its full-year profit forecast and make further adjustments to its winter capacity.